Since the demise of google reader I have to admit I have been useless at following blogs, and even more useless at commenting on things that have interested me. I used to love the button that reader gave you that could be put in the bookmarks bar and you could see the next unread post in its natural environment (I make it sound like some endangered animal!). But I going to each new blog post on its own blog with only the click of one button. Recently I have got to grips with all of my unread backlog of posts (OK thats a lie, but all the recent unread ones…) using Feedly. I do have a BlogLovin account but never really clicked with it. I mostly use the android feedly app but sometimes use it in the web browser which is easier when I want to edit the blogs I follow. The app is brilliant for catching up on blogs in those inbetween times when I have my tablet with me. 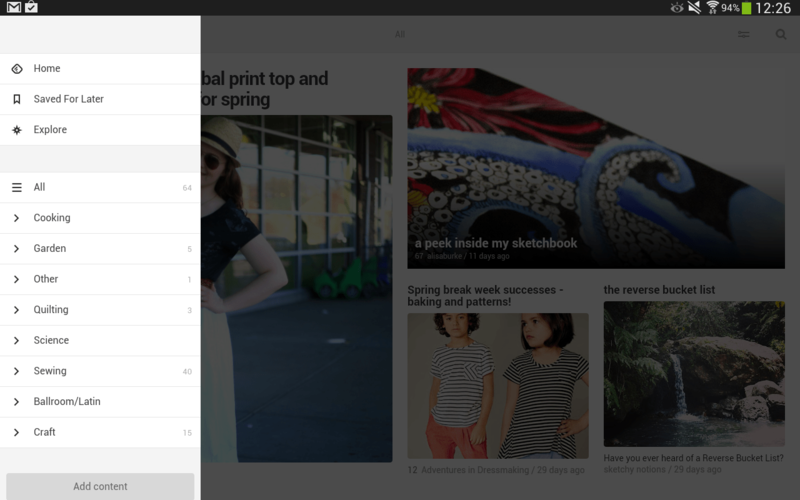 I like the way I can categorise my blogs into my own headings on Feedly. I can then review the unread posts by category or my whole feed, I can save/mark the posts to view later which I have been doing with any I want to participate with or which are good tutorials. You can also see the post on its own website with the click of one button within the app. The only real downside to it I found when getting started was that I imported all my blogs I followed in one go and the Android app doesn’t give you an option to move a blog you already follow to a category, only new follows. But after much annoyance at this I logged into the webpage and could do it all there very easily. My blog feed feels a lot cleaner now, and more functional. I just need to amalgamate the feeds from accidentally creating two accounts and I will have finished spring cleaning my rss feeds. What spring cleaning are you doing to your blog stuff? Do you regularly clean out your feeds or do you let it get the better of you and change it all in one go?